A little bit of New Orleans was wiped out early this morning. 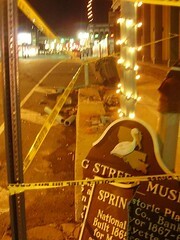 A car smashed down three of the posts holding up the second story balcony of the Spring Street Historical Museum on Spring Street. 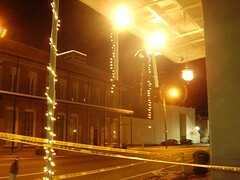 The building boasts the only remaining example of New Orleans-style cast-iron grill work in Northwest Louisiana. The good news? Shreveport Madam Annie McCune's chair remains safely tucked away on the second floor. Officers on the scene said the car that knocked down the posts suffered light damage. I can't imagine how horrible I would feel were I that driver. As low key as the museum is, I'm betting the driver doesn't even know what a one of a kind structure he (she?) hit.